I saw this today and wondered if anyone has used this and what are the benefits and drawbacks? It looks like it might need some supplementation with liquid feed occasionally, but my guess is that it would be very economical in the long run. 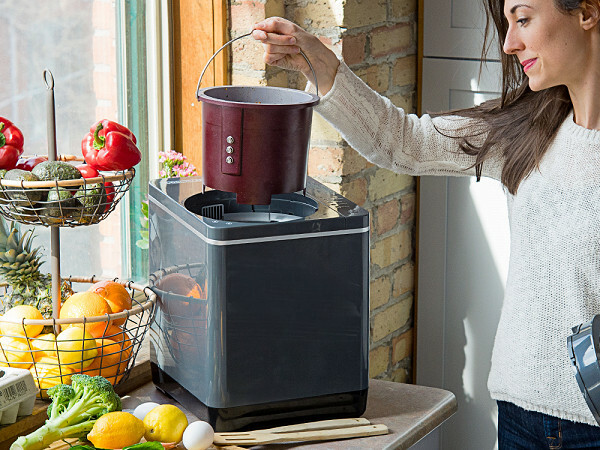 Reduce the volume of kitchen scraps and leftovers with this food recycler, discovered by The Grommet. An Odor- and mess-free way to help fertilize your yard. I am also thinking of this to use with poo balls (home made organic fertilizer recipe) to dry them out quick and without the smell permeating like it would with a traditional dehydrator or leaving them out to air dry. might be a waste of money. everyone tries to speed up natural processes, i think speeding up the composting process will lack more nutrients than letting it do its thing for a couple of months. as for the poo ball question,…not really sure, you dont think it will dry them out TOO much? One potential drawback is not knowing exactly what nutrients are available in the resulting fertilizer. I like knowing exactly what I’m using as I determine my fertilizing regimens based on the characteristics of the fertilizer.